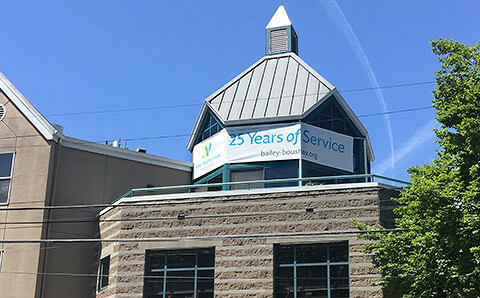 For over 25 years, Bailey-Boushay House has served the housing and health care needs of people living with HIV/AIDS and other terminal diseases. Thanks to funding made available from Mayor Jenny Durkan’s plan to serve 500 more people per night in homeless services programs, Bailey-Boushay House is now able to provide safe and accessible shelter services for up to 50 of its existing clients. The shelter will allow consistent oversight and treatment for these individuals, helping improve care and quality of life. The project is supported by the City of Seattle for November and December 2018 and will continue into 2019 contingent on additional funding. The shelter will open November 2018 and will run through the end of December 2018, with operation in 2019 dependent on funding. The shelter will primarily serve our existing homeless clients who, today, sleep on the neighboring streets. It will exist within Bailey-Boushay’s present facility. There will be no construction or roadside disruption. Shelter hours will be from 4:00 pm to 6:30 am. We will continue to have 24-hour security. The Bailey-Boushay House, operated by Virginia Mason, was the first facility built from the ground up for end-of-life care for people living with HIV/AIDS. To date, it has provided a sense of community and care for thousands of people not just here in Seattle, but across the Pacific Northwest. To better serve its clients in need, many of whom are currently homeless and sleeping on neighboring streets, Bailey-Boushay is seeking funding to open an emergency shelter at its current location, with up to 50 beds. The shelter fills a void in the community to provide safe and accessible interim housing for Bailey-Boushay’s homeless population, a critical issue among those living with HIV/AIDS. Unstable housing jeopardizes these individuals’ HIV care and overall quality of life. Bailey-Boushay believes the shelter is a necessary next step in their continuum of care, which will result in consistent oversight and treatment for these individuals as they tackle other issues, such as drug dependency, incarceration issues and mental health. The shelter is an extension of the organization’s Housing Stability Project, which builds skills and provides support for those who are homeless, or at risk for homelessness. The shelter embraces critical elements to be effective, including easy accessibility; crisis and interim housing; an environment that fosters community, with supportive health and social services; and assistance to return to permanent housing. We are currently working to secure funding for the project to have it open by January 2018. There will be no construction or roadside disruption. Bailey-Boushay is holding two community forums to answer questions and present plans for opening the shelter. Stop by on August 12, 2017 at 4:30 p.m. or August 16, 2017 at 6:00 p.m. to learn more about the process and what to expect. If you are unable to make either time, call 206-240-3269 or email Brian.Knowles@virginiamason.org with any questions. Glad you are taking a proactive role. I literally live across the street from your facility and I have no objection to this plan. Thanks for asking. The Bloodmobile will be accepting blood donations in Madison Park on Saturday. For questions about eligibility, please call 800-398-7888. MoveMend is excited to announce the addition of Dr. Ryan Simmons, physical therapist, to our team. Ryan earned her Doctor of Physical Therapy degree from #1 ranked University of Southern California Division of Biokinesiology and Physical Therapy in 2010, after 4 years of successful independent Massage Therapy practice in Chicago. With over a decade of health care experience in a wide range of settings, she is uniquely positioned as a true integrative clinician. Although her bread and butter therapy is based heavily on manual orthopedics, body mechanics, and gait analysis, she also has experience and clinical interest in woman’s health, yoga modification, neurologic disorders, and vestibular rehabilitation for vertigo and dizziness. Her patient care philosophy is rooted in the belief that keen observation, active listening, and hands-on discovery are the keys to successful intervention and the return of a patient to their highest level of function. You can make an appointment with Ryan directly from our website www.MoveMend.info. Feel free to stop in and say hello! I'd like to share some helpful information presented at MoveMend a few weeks ago regarding nutrition to speed recovery from injury. Hopefully you or someone you know will find it helpful. Aaron Shaw is a fitness therapist and proprietor of the MoveMend clinic. MyTown Pictures has produced a touching film on the subject of early-onset Alzheimer’s Disease. The film shares one family’s challenges and triumphs and the power of music to enrich and engage the lives of those touched by dementia. Come join the community in this free screening of His Neighbor Phil, which is followed by a community discussion. More than 5 million Americans are living with Alzheimer’s. Locally, the Art of Alzheimer’s works to “open hearts and minds to a different way of thinking about Alzheimer’s” by bringing attention to those affected by dementia.This free screening of the “His Neighbor Phil” (filmed in the small town of Zumbrota, Minnesota) is about the intersection of family, community, and the struggle with dementia.Proceeds from this event support The Artist Within, a free exhibition and event series at City Hall Lobby Gallery and Anne Focke Gallery, January 7 – February 26, 2016 – 7am – 6pm, Monday – Friday. The Art of Alzheimer’s, Full Life Care, NW Center for Creative Aging, and Alzheimer’s Association, Washington Chapter and Parkshore Retirement Community. Are you the type of person that seems to get ill just thinking about cold and flu season? Do you get frequent infections throughout the fall and winter? Once you’re sick, do you have trouble regaining health? Here are some ideas to keep those seasonal illnesses at bay. First off, not all illness is “bad.” I tend to look at it as exercise for our immune systems—if we’re never challenged, our immune cells don’t have the opportunity to build up and create memory immune cells for quicker response against future illness of the same kind. Here are a few things to consider when trying to stay healthy this season. High levels of cortisol (a stress hormone) tend to suppress or lower our immune response to invading pathogens. So make time to decompress and reduce your stress level. If you find you’re responding to stressors in a less than positive way, work on mentally reframing the experiences—it’s not about the stressors, it’s about how we react to them. Whether you do yoga, cook, dance, listen to music (or make your own), take bubble baths, or embrace your inner child and color in coloring books, do it and do it often! For additional support, drink some stress relief tea throughout the day and/or take adrenal support supplements. Also be sure to get adequate sleep, since increased stress and lowered immunity are among the many effects of sleep deprivation! Exercise helps with lymph flow and the circulation of white blood cells, thereby increasing the detection of illness and helping to combat the illness more quickly. Aim for at least 30 minutes of moderate activity, 5 days per week, to get a decent fitness dose. Of course, check with your medical provider before beginning a new exercise regimen. Eating for immunity ideally includes a lot of anti-microbial herbs such as garlic, ginger, and parsley. You should also include immune-modulating mushrooms, particularly shiitake. Combining these mushrooms and herbs in a mineral-rich broth is one of my favorite seasonal meals. This is by no means an exhaustive list. As always, consult a supplement-literate physician before adding them to your regimen, in order to avoid any potential medicine interactions and to make sure they’re right for you. Regular use of a neti pot/saline rinse can decrease adherence of pathogens to our nasal passages, which is a common entry point of microbes. Although it can take some getting used to (and the willpower to do it), it is well worth the benefits! Astragalus is an adaptogenic herb that helps keep you protected by enhancing immune function, and helps you deal with stress. That makes it a great preventive herb to take on a daily basis to build up your immune system and help you cope through the holiday season. In the first 48 hours of feeling ill, consider frequent dosing with echinacea root. Beyond the initial phase of illness, the root may have little or likely no impact, but when used correctly can be quite helpful. The aerial parts of echinacea however, can be taken throughout the season to strengthen the immune system. Andrographis is an excellent immune-stimulating herb to take in the beginning stages of illness. It works to decrease the symptoms of the acute cold or flu quickly, particularly helping to provide relief from sore throat or fever. There is an undeniable connection between the gut and the immune system. An incredible 80 percent of our immune system is located in our digestive systems. Probiotics should be taken daily throughout the year to support beneficial flora in the GI tract. Vitamin C is a classic immune-boosting standby, and can be dosed in high amounts, up to bowel tolerance, as more is required during acute infections. Lower amounts can be used daily to ward off illness. Zinc lozenges, when used within the first 24 hours of illness, can help to shorten the duration and decrease the symptoms of the common cold. Zinc given at appropriate dosages over time can help prevent infections. Medicinal mushrooms contain polysaccharides and beneficial compounds that work to modulate or enhance immune function. Taking a mushroom extract or capsule supplement on a daily basis can be very beneficial in helping the immune system to function properly. Stay healthy this season and don’t forget to frequently wash your hands! Visit Pharmaca in Madison Park or online at pharmaca.com for more information and product suggestions. Dr. Jennâ€™s Health Tips: Are you ready for summer? Summer in Seattle is approaching, and outdoor activities are even more abundant. Renew your commitment to being fit, happy and healthy! Here are some ideas to help you with exercise recovery and environmental exposures. Be prepared to stay hydrated. Dehydration can cause headaches, muscle pain, dizziness and nausea. Have on hand water and electrolytes, such as Vega Hydrator powder or Nuun tablets. Add in Trace Mineral ConcenTrace drops to improve hydration even further. If you’re outdoors, wear your mineral sport sunscreen. I recommend Juice Beauty Sport Moisturizer or Thinksport sunscreen, which are both chemical-free, sweat- and water-resistant sunscreens. Devita Solar Body and Solar Moisturizer for the face are also great choices for a sheer, mineral-based sunscreen. During the days when insects are rampant, avoid mosquito bites by making sure to spritz on some Quantun Health Buzz Away insect repellant. This product is essential oil-based, DEET-free and quite effective at keeping the bugs away! Any time you provide stress on your muscles, you want to make sure to build the muscle up by consuming protein post-workout; protein shakes are a simple, fast way to achieve this. Leucine is an amino acid that is especially important at contributing to skeletal muscle mass. L-glutamine amino acid helps to prevent muscle breakdown, and the powder can be added to protein shakes. Although whey protein is often considered as having an “ideal” amino acid profile, certain plant protein powders are adequate for those avoiding dairy. My favorites are Plant Fusion Phood and Sun Warrior, Warrior Blend plant-based powders. Mix these with your favorite dairy-free milk in a blender bottle for a quick, on-the-go recovery drink. To help with post-workout recovery, I recommend New Chapter’s Zyflamend capsules as an effective herbal anti-inflammatory combination product, alongside a magnesium product. Zyflamend is a nice alternative to taking NSAIDs, and magnesium helps with muscle pain. Eating anti-inflammatory foods and avoiding inflammation-promoting foods is important. Herbs and spices, such as ginger, turmeric, cinnamon and garlic, especially when combined with lots of vegetables, are all good choices. Drizzle this “Sunshine Dressing” on your veggie-loaded salad, for a delicious recovery meal. Did outdoor activities, such as swimming in a chlorinated pool, leave your hair dry, dull and lifeless? If so, revitalize it with an apple cider vinegar hair rinse: mix ½ cup of apple cider vinegar with 1 cup of water, and add in 10 drops of essential oils of your choice; lemon, rose and/or lavender essential oils work well for this. Instead of chemical-laden self-tanners, consider going the less toxic route by choosing jane iredale’s Tantasia self-tanner. The natural color will develop with daily use from a sun-kissed glow to a healthy tan. Join us at the Madison Park Pharmaca on Saturday, June 6th from 11am–3pm for our Sports Nutrition & Fitness event. Enter to win a Fitbit Flex wristband (a $99 value), enjoy chair massages, try free samples and take advantage of special savings! The prime retail location of the old Harbour Pointe Coffeehouse wasn’t idle long after HPC’s mysterious demise. Let’s welcome MoveMend to the neighborhood. MoveMend is a new clinic specializing in shoulder, arm, and hand therapy as well as medical fitness training. Aaron Shaw, a Madison Valley resident and highly experienced therapist, along with his associate, physiologist Sahba Seifi, provide expertise in hand and upper extremity rehabilitation and individualized personal training services. Fitness training assessments are performed as a team, meeting with their clients to develop a custom science-based training program that’s safe and fun. One-on-one and pair training sessions are available, and MoveMend will be offering small-group “boot camp” sessions in the summer. 10-pack of training sessions: $1219. Includes 90-minute assessment with Aaron and Sahba and a welcome gift package valued at $50. You can sign up for their newsletter at MoveMend.info to hear about special offers and their free seminar series on health and fitness-related topics. Therapy services start April 28th and personal training services start May 11. Holidays are a time for spending time with family and friends, spreading joy and giving back to the community. But sometimes the season can also bring tension, worry or anxiety about holiday expectations and obligations. Start practicing these healthy habits that can help minimize holiday stress–and keep them up throughout the year! Reserve enough time for sleeping. Without adequate sleep, our perception of stress is blown out of proportion. Keep lavender spray by your bed to promote a relaxing environment, or even add a couple drops of lavender essential oil under your pillow at night. Try to fuel yourself with healthful foods, rather than grabbing the carb-heavy, sugar-filled foods that we often gravitate towards in times of stress. Nutritious foods like fruits and vegetables provide the building blocks for the important neurotransmitters and hormones we need to deal with stress. Don’t forget to continue your regular exercise routine. Exercise produces endorphins that ward off negative feelings while keeping us mentally centered and grounded. When you find yourself getting worked up, try to focus on your breathing. Inhale for 5 seconds, followed by a 5-second exhale, and repeat. The goal is not to bring more oxygen in, but to slow your breathing. For added benefit, consider using an essential oil diffuser filled with lavender, rose or clary sage. These are especially helpful while practicing breathing exercises or meditation at home. If you’re not already taking a B-complex, consider starting one. In times of stress, B vitamins are often depleted, so replenishing your body’s resources is important. There are even B-complex formulas specifically designed to help you deal with stress. Another supplement to try: magnesium. Whether consumed in a powder or capsule form, magnesium helps us to calm down and release the tension stored in our muscles. Drink a warm cup of magnesium “tea” at night for the added benefit of a good night’s sleep! Lastly, vitamin D is a great way to support energy production, immune and bone health, and help prevent seasonal-related mood issues. Adaptogenic herbs can help your body adapt to stress, and support positive responses to stressors. Some adaptogens include ashwaghandha, rhodiola, holy basil and maca. Purchase these herbs in capsule, tincture or tea forms, as a single herb or a combination product. If stress has you feeling excessively worried and anxious, reach for nervine herbs. These work with your central nervous system to calm you down and restore emotional balance. Look for nervines such as lemon balm, passionflower, skullcap and chamomile. As always, certain medications may interact with some herbs. Make sure to check with a health care professional before beginning a new product with potential interactions. Stop in to the Madison Park Pharmaca and check out products that can help you deal with the stress of the holiday season and throughout the year. Our helpful staff can direct you to the items that work best for your individual needs. Happy holidays! Like the jello salad at Thanksgiving dinner, our health tends to get pushed aside during the holidays. This year, take a few extra steps to ensure proper digestion and reduce the risk of post-holiday sluggishness. While indulging in delicious holiday foods, remember to eat your vegetables! The fiber can help curb blood sugar spikes and improve GI motility. A nice rule of thumb is to make sure at least half of your plate is full of vegetables, especially dark leafy greens and cruciferous vegetables (think cabbage, kale, brussels sprouts, broccoli, bok choy and cauliflower). Although emotions can be rocky around the holidays, it’s best to sit down to a meal when you are calm and not feeling upset or stressed. Ensuring our bodies are in a predominantly parasympathetic mode (“rest and digest”) rather than a sympathetic mode (“fight or flight”) when we eat provides more digestive strength and less risk of indigestion. Another idea: Try to chew your food 100 times per mouthful. Even if you can only get to around 50, the process allows for more mindfulness when eating and decreases the chance of overeating. And because the process of breaking down food starts as soon as the food hits your mouth, chewing slower and longer leads to better uptake of nutrients and a happier digestive system. While it is very important to stay hydrated, avoiding liquids during a meal enhances digestion. If we ingest copious amounts of fluids with food, it dilutes our stomach acid and decreases the release of digestive enzymes, therefore weakening digestion. If you must drink during a meal, drink only small sips of tepid or warm liquid. Before meals (approximately 15-20 minutes), consider taking bitters or drinking one tablespoon of raw, unfiltered apple cider vinegar in a small amount of water. This kick-starts the digestive juices, has an alkalizing effect on the body and protects against indigestion after the meal. Digestive enzymes may also be taken to help break down food. Try to include digestion-promoting herbs in meals, such as turmeric, cumin, coriander, ginger and cayenne. If you experience reflux or indigestion symptoms after meals, reach for DGL (deglycyrrhizinated licorice) tablets—rather than calcium carbonate products—to quickly ease the symptoms. Specifically for gas and bloating, consider carminative herbs such as fennel, ginger, peppermint and cinnamon (Gaia Herbs’ Gas & Bloating tea or capsules are typically very effective). Demulcent herbs, such as slippery elm, marshmallow root and aloe vera gel, can help coat and soothe the digestive tract (find them in Thorne’s GI-Encaps). In addition, taking a brisk, 15-minute walk after meals can help to keep our blood sugar balanced and stimulate the digestive tract. For long-term poor digestion or leaky gut issues, L-Glutamine powder can help to repair gut mucosa. Triphala products can strengthen the digestive system, and work as a mild laxative. And Probiotics and fermented foods help the gastrointestinal terrain stay healthy, since good flora is essential to digestive health. For occasional relief, try abdominal castor oil packs, which have anti-inflammatory action and may help with digestive pain. Materials for the castor oil pack include castor oil, an old t-shirt or cloth, wool or flannel fabric, and an external heat source such as a heating pad or hot water bottle. First, apply a thin layer of castor oil to the abdomen (roll-on castor oil can be a less messy option). Put on the old t-shirt, and then cover with the heavier wool or flannel fabric. Apply the heating pad on top of the layers, lie down and allow the relief to seep in over the next 30 minutes—or hopefully much longer! Feel free to visit Pharmaca in Madison Park to talk with one of our licensed health care professionals and check out the digestive supplements section to learn more about natural solutions to digestion problems. Multiple times each day I find myself wandering back to the Sleep Aids aisle with Pharmaca customers who are having a difficult time finding rest. Do you have problems falling asleep? Staying asleep? Are you a night owl who needs a siesta each day? There are many reasons why people experience sleeplessness—and pinpointing the true problem can help to find the best solution. If you find your best work is done at night but you're sleepy in the morning and throughout the day, you might have what’s called a reverse cortisol curve. Cortisol, the stress hormone produced by the adrenal glands, typically spikes around normal waking times (e.g. 6 or 7 a.m.), and again at around noon. This allows a healthy human to get the day started, with an extra boost at lunchtime. But the stresses of everyday life and the standard American diet can result in a flatline of cortisol during the day and a spike at night—which manifests in evening energy surges and complete fatigue in the morning. To correct this, you can consider using natural supplements like rhodiola in the morning to mimic the normal cortisol patterns, and magnolia bark at night to rapidly decrease cortisol. You can also begin to address blood sugar issues, as these two concerns seem to be closely linked. For those who can fall asleep but wake frequently during the night, magnolia bark may also be helpful. This can prevent cortisol spikes from happening at night. Sometimes, eating a high-protein snack before bedtime can also help to regulate blood sugar while you sleep. The most common solution for trouble falling asleep is melatonin. This is a natural hormone that our bodies produce when we should be sleeping, and it’s a potent antioxidant in high amounts. Because of this, melatonin loses its sedative qualities with doses higher than 5 mg. When first trying melatonin, the key to success is going “low and slow,” as some side effects can include vivid dreams or nightmares, or a groggy feeling in the morning. Start with the lowest dose possible, typically 1 mg, and work your way up to find the perfect dose for you. There are a myriad of ways to address sleeplessness, and a qualified natural health practitioner can help you find solutions tailored to you. Stop in and chat with one of the licensed health experts at the Madison Pharmaca to help you rest easy tonight!